Office Space - Tracy, California. 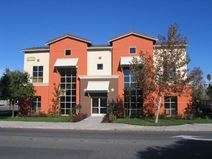 This business center in Tracy has fully furnished office suites available. Each office is equipped with phone, fax, internet access and cable TV. A staffed reception is provided as well as a stocked kitchen and plenty of parking. The center has two conference facilities available with extensive technology and optional catering. Tenants will have access to a mailbox and administrative staff. Business solutions are also available for those who don't require regular office space. These solutions offer a reception service, business address, and access to offices and admin staff.